Give Extra for our Extraordinary River! Susquehanna Heritage is participating in the Extraordinary Give — Lancaster County’s Largest Online Giving Day! On Friday, November 16, you will have just 24 hours to donate to Susquehanna Heritage. 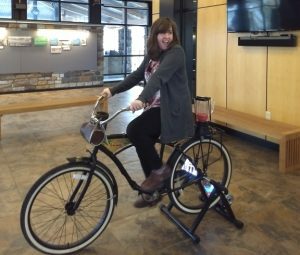 The more donations Susquehanna Heritage receives, the farther it’s stretched. This year the stretch pool totals over $500,000. It’s a great opportunity for every dollar you donation make an extra impact on the river. Please help us to spread the word about the ExtraGive on Friday, November 16th! Remember the Extraordinary Give is entirely ONLINE so the best way to share is online and via email! Maybe you can’t wait for the new boat tours on the river, you love our educational programs, or you just like to ride the trails — we’re counting on your to spread your love for the river and inspire others to give. So spread the word and save the date! Friday, November 16th is the day to donate online to Susquehanna Heritage. Join us at Our River Party! 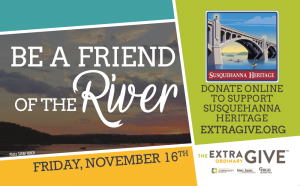 Susquehanna Heritage will once again host our Extraordinary River Party from 4 PM to 8 PM on ExtraGive Day at Columbia Crossing! This is our opportunity to invite all the friends of the river to Eat, Drink & Give! Join us to enjoy live music from the Dreadnought Brigade Duo who will be serving up ‘feel good’ tunes of blues, rock, and folk. Scrumptious appetizers, beer, wine, and B(ike)YO wine slushies will make it a true cocktail hour. Giving stations throughout the party will help us build funds for the river! Let’s celebrate the river together! Minimum donation of $25 required by ExtraGive.org. Questions about the ExtraGive? Call Hope at 717-449-5607 ext 1.